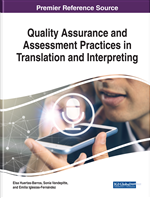 Editing, revision and post-editing are part and parcel of professional practices in the translation industry and quality assessment has become an established element of translator training. Industry revision practices are mirrored in the translation classroom to prepare students for their future professions and to teach them quality criteria to exert quality control and assessment practices, such as self-assessment against criteria of collaborative practices. Peer feedback as a didactic practice reflects – at least to a certain extent – expert translators’ professional assessment practice. Student peer feedback is usually regarded as a productive platform for the development of evaluative skills and for learner self- regulation. Yet, reports about experiences with peer feedback in translation, analysis of how students execute peer suggestions in their texts (implementation performance), the impact peer feedback has on translation competence and reflection about these are scarce in the Translation Studies literature. Studies by Lindgren, Sullivan, Deutschmann, and Steinvall (2009), Wang and Han (2013) and Flanagan and Heine (2015), Lisaitė et al. (2016) and Vandepitte (2016) are exceptions to the rule.